This tutorial article is for all the non SSS (Social Security System) members that wanted to take the benefits of an SSS member. SSS is a state-run, social insurance program for non-government employees in the Philippines. For you to avail the series of benefit such as Sickness, Maternity, Retirement, Disability, Death, Funeral and SSS loans such as, Salary, Housing & Business, you must first become an active SSS member by paying monthly contribution. In fact, SSS assures that contributions that you remit became savings for the future that will serve as a basis for the granting of benefits in times of contingencies. Thus, getting SSS number is the first step. In this article I will share with you the steps and the requirements needed. Step 1: Get a copy or download SSS E-1 Form from the SSS website. 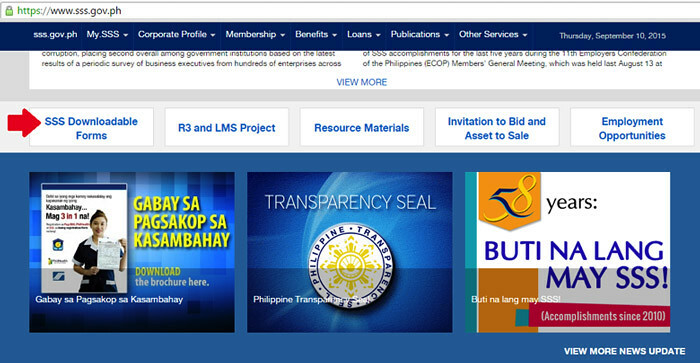 At the lower part of SSS homepage, click SSS Downloadable Forms. Step 2: Under “Registration & Membership” select Personal Data Record. See the screenshot. Step 3: Fill-out the E-1 Form in two (2) copies the applicable portions as follows; Parts I-A, B and D, if applying for SS number as pre-employment requirement, Parts I-A, B, C and D, if applying for Self-Employed, Overseas Filipino Worker (OFW) or Non-Working Spouse membership. For Part I-B “BENEFICIARY/IES”, use separate sheet, if necessary. Step 4: Submit your E1 form to the nearest SSS branch/office and attach your photocopies of valid IDs and birth certificate. Also present the original copy of your Birth Certificate and ID’s. Step 5: Finally, wait for your copy of E-1 form with SSS number. Your SS number is your lifetime number. You should not have more than one SS number. Once you become a member of SSS, you can monitor your account online using the official SSS website that they provide for all the members. Although the website receives a lot of negative comments from the users, most of them just don’t understand what they are doing. To help them easily understand, as an SSS member I created some instructions that clearly show every step so that the beginner can easily follow. Here are some of the tutorials about the SSS online inquiry, you may start by registering your account online.